you can check the Status of your ID Card if its ready or not. Identification Number and hit the ‘check now button’. 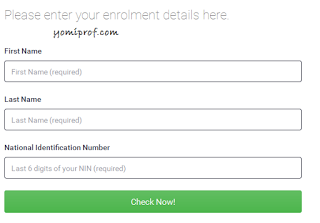 Give it few seconds to load, and it will display the status of your NIMC card. while others are not yet ready. Check the status of your NIMC today. What Do You Think About Infinix Edge? Coming Soon! I have checked mine ,Thank God mine is ready to take out but its have been long before I got mine cos I have been checking it every 4 days. Yours should be available, have you checked? Very terrible a country i wonder if people are still getting paid working for that agency called NIMC. I have register since September 2013. Till date, card not ready. Can I still enroll? Is it too late? I enrolled in Nov 2014. I check the portal at least once a month. Id card isn't ready. Time to quickly check mine..